IS THIS MONARCH SEAT FOR YOU ? The best seat for Larger People. Dual Top Seat Cushion for Extra Support. High Density Contoured Foam Construction. 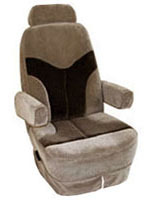 The Monarch rv seats were created for the larger person with extra support in the design and construction. Like its counterpart in the rv furniture line, the foam design and complex stitching design place it among the elite few rv seats considered to be the rv captains chairs that all others are compared to. These rv seats are truly a Luxurious rv Captains Chair. The Monarch rv seats are available in Ultimate Leather, which is as soft as calfskin, yet cleans easily with mild soap and water. All rv furniture is also available in cloth.